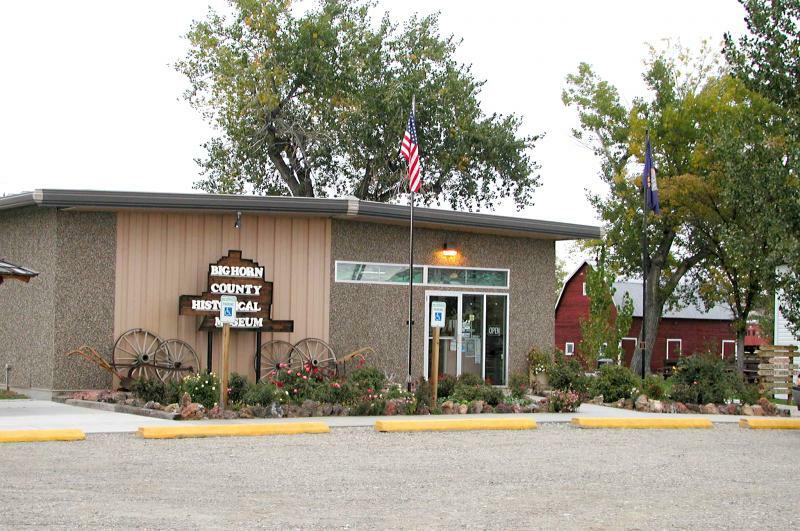 Situated on 24 acres, the Big Horn County Historical Museum was established in 1979. The Museum complex consisting of twenty permanent buildings represents the interest and involvement that local residents, the business community, the Big Horn County Historical Society, the Historical Museum Foundation, and local and state government have taken to preserve, exhibit and interpret the areas past. As you walk through the buildings that make up the museum, you are walking through the pages of history and touching the footsteps of such people as the first Americans who roamed the high plains in search of buffalo; traders and settlers that came in search of adventure; and the early day homesteaders who toiled out a living by farming and raising livestock. They all wrote their chapters. The main building features a rotating exhibit, which changes each year, a museum gift shop which offers a large selection of books, locally crafted Indian bead work, Montana made gift and other items. Also inside the main building you will discover a staffed State Visitor Center, where you will find a wide variety of state and regional travel information. Your tour of the Big Horn County Historical Museum begins with the 1911 farmhouse. It’s located to the East of the main exhibit building. The farmhouse was built in 1911, about five years after this part of Montana was opened for homesteading and about ten years after the military abandoned Fort Custer, which was located on the bluffs, south of here across the Big Horn River. The home and the barn located at the rear of the structure stand on their original site. The farmhouse contains a fine collection of items from the turn of the century and will give you an idea of the quality of life during that time. The LaForge log cabin was built in Lodge Grass, Montana, by Thomas and Tom LaForge. Thomas LaForge, served as a scout for military campaigns led by some of the West’s most notable military commanders, including Custer, Terry and Gibbons. Thomas was born in Ohio in 1850. He came to Montana with his parents in 1865 and at the age of about nineteen he chose to live among the Crow Indians and was later adopted into the tribe. This 18’ x 24’ cabin was built out of logs from the Wolf Mountains and stood through three generations of occupancy until 1981 when it was moved to the museum site. The interior of the cabin features only the necessities needed to make it a home. The barn was built in 1916 as a part of the original farm site and was a practical addition to the working farm of the era. Today, the barn is used to display a variety of horse tack, branding irons, traps, garden tools, a large collection of woodworking tools and items needed in tending farm animals. The items displayed in the blacksmith shop were used for years to keep a vast variety of farm machinery in operating condition to farm the thousands of acres under tillage by Campbell Farming Corporation, which once operated the world’s largest privately owned wheat farm. Towering over the barn is a windmill used to pump water from a well before rural electricity was available. Some area ranches still use windmills to provide water for animals in remote areas where electricity is cost prohibitive. A 1919 Altman Taylor tractor, powered with a gasoline engine; a Mac truck and threshing machines of various models can be seen in and around the Farm Exhibit area. Part of the equipment is fully restored and operational and some of the equipment needs restoration as funds and time allow. The tractors, rakes, mowers, planters, and other farm equipment depict the rapid change in technology in farming during this century. The major crops raised in this county include hay, barley, wheat, sugar beets and corn. The small community of Corinth, 23 miles northwest of Hardin, was established in 1908 and grew up around the Chicago, Burlington and Quincy Railroad line. L.R. Good, of Sheridan, Wyoming, moved to Corinth in 1918 and built this store with living quarters in the back. This building also became the Corinth Post Office. The interior of the store has been restocked to give our visitors a taste of what was available in a small country store. The post office boxes are original and were in the building when it was moved to the museum in 1986. Fly Inn was a cafe and filling station that was built between Hardin and Billings, Montana to meet the needs of the new transportation system that was developing in the region. In 1928, U.S. Highway 87 was under construction between Billings and Hardin. The highway was completed in 1933. To meet the needs of the travelers on this 50 mile stretch of road, the original Fly Inn was opened by Lee Fly. This 12” by 12” structure was an addition built in 1937. Interstate 90 followed a different route and the Fly Inn was closed in 1958. The exhibit in the building represents the tools and other equipment that was necessary to keep those wonderful automobiles in running condition. Maps, soda and other items that were needed to assist those weary travelers were also found available in the local “filling stations”. The station was moved to the museum in 1986 and continues to bring nostalgic memories to those who found help along what is now known as the “old road”. 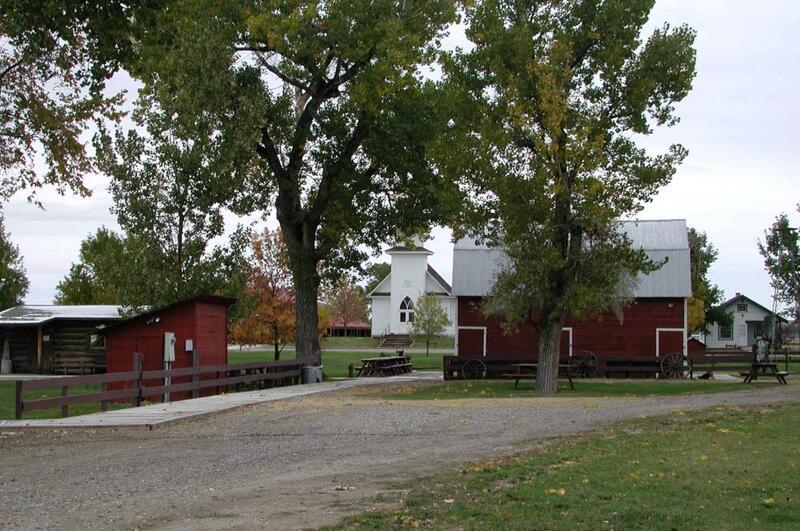 The Fort Custer Stage Station was built in 1994, with funds raised by the Historical Society, to house their growing collection of horse drawn wagons and buggies. This large wooden building was designed to resemble one of the barns at Fort Custer. Fort Custer, the finest cavalry post in the world, was built on the bluffs south east of this site in 1877. The Fort was abandoned in 1898 and in 1903 the buildings were demolished and nothing was left at the site. 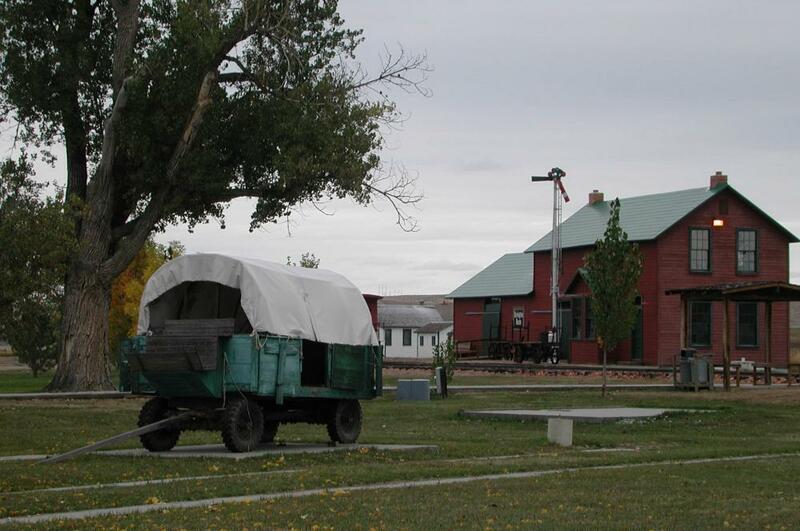 While in the stage barn you will see the mud coach which ran from Fort Custer to Rock Springs, Wyoming, grain wagons used on the Campbell Farming Corporation, a surrey, a variety of buggies and wagons, as well as vintage motorized vehicles. 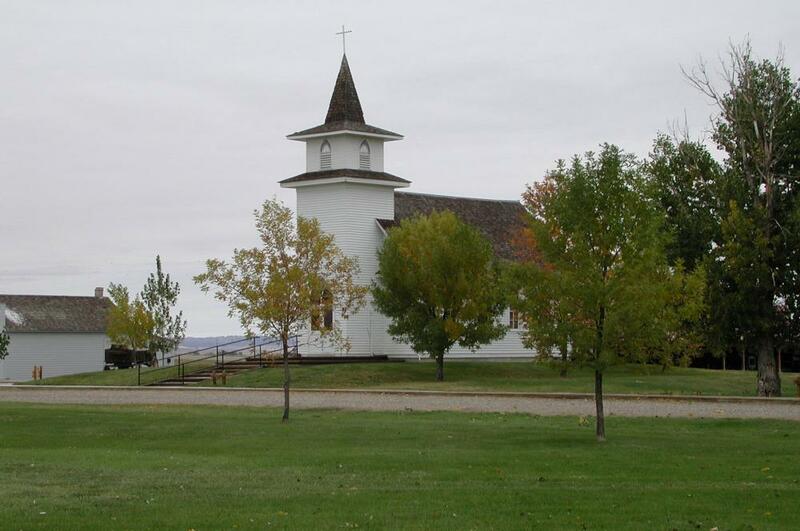 The Christ Evangelical Lutheran Church of Hardin was built by German settlers in 1917. Intense anti-German sentiment in the community forced a brief closure during World War I. The church was saved from destruction, when the historical society moved it to the museum complex in 1981. This was the first building to be moved to the museum. Restoration included building a new steeple, complete with bell, plastering the walls and furnishing with all the original furniture and fixtures. Regular nondenominational services are held each Sunday from June through August and visitors are invited to attend the church services. Hardin’s first hospital was built in 1915, by Dr. O.S. Haverfield on 3rd Street. The hospital, known as the Haverfield General Hospital, brought modern medicine to our area. Recruiting RN’s became difficult due to the lack of housing, so this small building, which originally served as the rectory for the Catholic Priest, was moved from its original site and placed behind the Haverfield Hospital to serve as a home for nurses. The young nurses didn’t care for renting the small house, but felt it would be a great place for breaks and resting. A new community hospital was constructed in 1945 and the Haverfield Hospital was used as a nursing home and the small house once again became a rental. In 1991, the house was moved to its final resting place at the museum and is used to interpret those early days of medicine. The 1922 Halfway School recalls the one-room school days of the past. 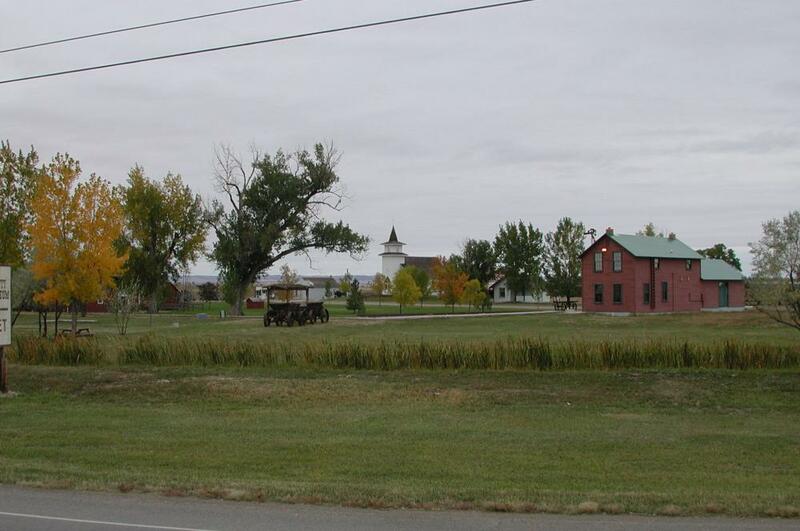 The school, which once served area children between Hardin and St. Xavier, Montana, approximately 12 miles south of Hardin on State Highway 313, was moved to the museum in 1983. The school offered a fully equipped classroom of the period, as evidenced by the various sizes of desks, books and other items used by teachers as they taught several grade levels in one room. To the west of the school is the historic 1922, merry-go-round that was once located in Custer Park. The City of Hardin donated the merry-go-round in 1996. The scene is complete with the old school bell well pump and out house. The humming sound of fifteen gasoline powered 3060 Aultman Taylor tractors plowing unbroken sod was heard for the first time 80 years ago when the Campbell Farming Corporation leased land on the Cheyenne and Crow Indian Reservations to raise wheat to help alleviate food shortages following World War I. The Campbell Farming Corporation was founded in 1919 by Thomas D. Campbell, who was born in 1882 near Grand Forks, N.D. At the young age of 17, Tom managed his father’s 4,000 acre wheat farm. Campbell approached President Wilson with the idea of raising wheat on a large scale using mechanized farming. He entered into a contract with the government to lease Indian lands on the Fort Peck and Crow Reservations of Montana. By the fall of 1918, Campbell had 7,000 acres in production, but due to the drought of 1919, most of the crop was destroyed. Campbell then moved his equipment out of the Fort Peck area and concentrated on the Crow reservation land. By 1923, Campbell Farming Corporation employed 100 men and cultivated 10,000 acres. Thomas soon became known as the “King of Wheat Growers” because of the mechanized farming technique he developed to raise wheat in Montana’s semi-arid climate. Campbell Farming Corporation discontinued their farming operations in 1987 and in 1996, the cookhouse, a bunkhouse, shower house and commissary from the Camp 4 site were donated to the Big Horn County Historical Society by the Campbell Farming Corporation. They were moved to the museum site in 1997 and restoration was completed in 1998 with funding from the Corporation and the Campbell Family Foundation. Camp 4 symbolizes the triumph of mechanized farming in Big Horn County. Only images are left of the lines of wooden grain wagons and granaries, the rows of identical combines setting records for bushels of wheat harvested in a day, and the workers gathering for dinner in the cookhouse. 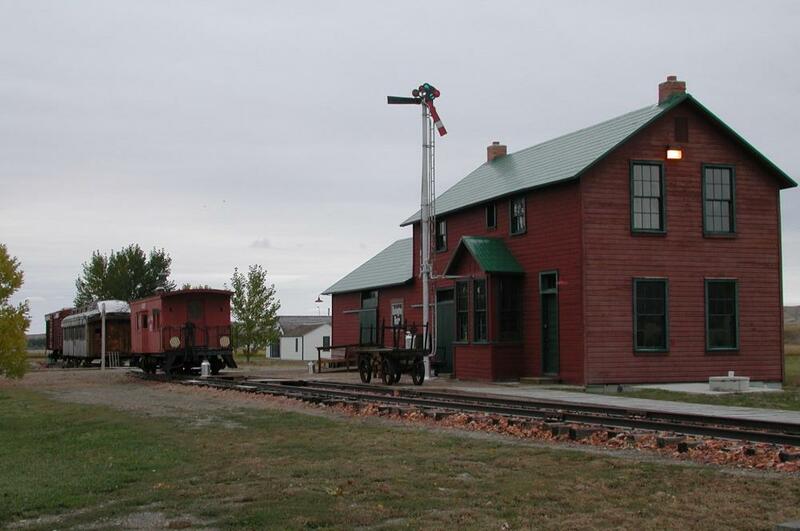 The Chicago, Burlington & Quincy Railroad opened a station in 1906 at Lodge Grass, Montana. The depot, which originally didn't have running water or electricity, became the center of the flourishing small community in southeastern Big Horn County. Almost everything came by train to Lodge Grass-even the news. The depot came to rest on the museum grounds in 1987. The main floor includes a waiting room, agents office-complete with some of the early day equipment, and the warm and cold freight rooms. Displays include early day railroad equipment, carts, lanterns and photographs. The second story living quarters is furnished with items from the Arthur Westwood family, who once resided there. Westwood was the Lodge Grass depot agent from 1906-1944. Resting on the railroad track is one of the last wooden stock cars, a turn of the century Way car and an 1880s drover’s car. The drover’s car is where the ranchers rode when they shipped their livestock. The drover’s car is very similar to early day coach cars. Teepees, which served as the early day homes of the American Indian, are erected each summer. Eighteen lodge pole pines, which grow in the area mountains are used as the structure for the teepees. Two poles are used to keep the flaps open and allow the smoke to escape. The opening or door of the teepee faces the east to prevent the northwest winds from entering. 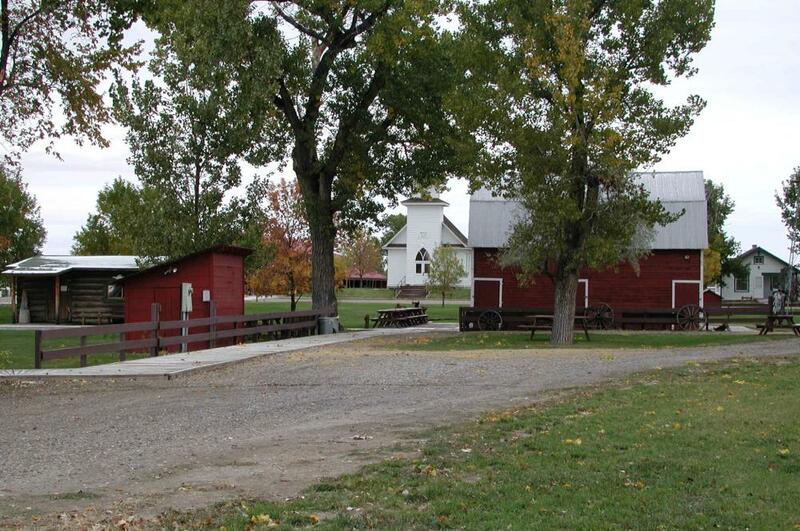 Montana celebrated its Statehood Centennial in 1989 and the museum honored that birthday by developing the park and picnic area. The park serves as a home to 41 trees that signify Montana’s admission as the 41st state to enter the union, and allows our guests a great spot to enjoy a picnic. Open year round, daily May to September and week days only during remaining months.